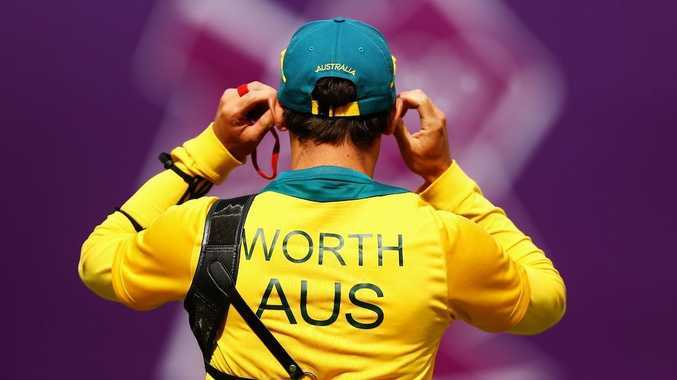 GIANT-KILLING Australian archer Taylor Worth trounced world No.1 Brady Ellison in the second round of match play to move right into medal contention at the London Olympics. Worth coped superbly in flukey winds at Lord's, thrashing Ellison 7-1 after starting the day with a one-arrow shootout victory over local hope Alan Wills. The 21-year-old from Perth has now won his last three encounters with Ellison, a key member of the US squad which shocked red-hot favourites South Korea in the semis of the team event on Saturday before falling to Italy in the gold-medal match. But Ellison was never in the hunt against Worth on Wednesday, dropping the last three sets to lose 29-29 27-25 29-26 27-26. "It's obviously a confidence-boosting win," said Worth.